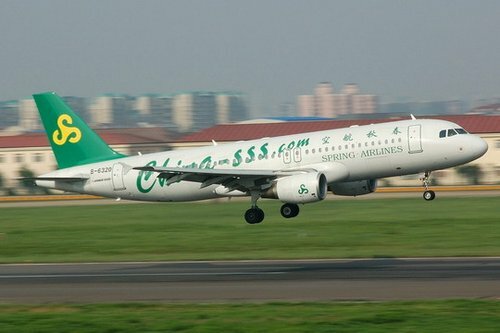 Spring Airlines, a Shanghai-based low-cost carrier, reported a net profit of 470 million yuan ($71.2 million) in 2010, a year-on-year increase of 240%, Friday's China Business News reported. The carrier's chairman Wang Zhenghua said the company's transportation capacity didn't increase too much in 2010, but its business turnover rose 62%, reaching 4.32 billion yuan ($654.4 million). "This shows that the demand is quite good," Wang said. Wang predicted China's air transportation market in 2011 will not be as robust as last year and Spring Airlines' profit margin may dip accordingly. "We plan to increase transportation capacity 30%-40% this year, but our target for profits is approximately the same as last year," said Wang. According the report, Spring Airlines, the country's only low-cost carrier, planned to set up a secondary hub in northeast China's Shenyang city or north China's Shijiazhuang city this year. Wang said he also hoped to operate more flights to and from Shanghai. The chairman said he is satisfied with its Shanghai - Hong Kong route and Shanghai - Ibaraki route (about 80 kilometers northeast of Tokyo), saying the average passenger load factor is as high as 90%-95% on the two routes. Spring Airlines will continue to expand its international route network this year. The possible international and regional destinations include Macao, Taiwan, Southeast Asia as well as other cities in Japan, the report said. Wang stressed that this ambitious plan still needed approval from the Civil Aviation Administration of China (CAAC). Established in 2004, Spring Airlines is one of China's first private airline companies. It operates more than 50 domestic routes and two regional and international routes. Its fleet comprised 21 Airbus A320 jetliners by late 2010. China's aviation industry boomed last year as 267 million Chinese traveled by air, up 15.8% year on year, with profits of domestic airline companies hitting 35.1 billion yuan ($5.32 billion), Xinhua reported Wednesday.